With the perfect location to all that Myrtle Beach has to offer, Bay View Resort is the spot to stay. Located right off the Myrtle Beach Boardwalk and within walking distance to many attractions, restaurants shops and of course the Atlantic Ocean. Have you ever wanted to see a real-life fire show? Or attend a traditional Polynesia luau? Well, you are in luck, because right in the heart of Myrtle Beach, you will find Sharkey’s Fire Luau Show and Hawaiian Buffett. 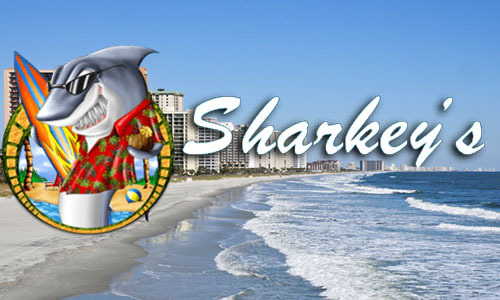 Sharkey’s is an oceanfront beach bar and restaurant that is located at 600 North Ocean Boulevard – almost right next door to Bay View Resort. Starting promptly at 6 pm, guests will be greeted by one of the many Polynesian dancers where you will receive a lei greeting and be able to take a beautiful family or group photo with the dancers. As you’re traveling through the isles of the South Pacific, you will make a stop for the all-you-can-eat Hawaiian Buffett. There are decadent choices of dinner and dessert options, so make sure that you work up an appetite during the day and come hungry! After you are finished eating, the show will begin. You will embark on the journey through Samoa, Tahiti, Tonga, Fiji and the islands of Hawaii. The show is very interactive and participation is encouraged. Whether you are entranced by the acrobats or learning the words to the songs, this is a night that you will surely not forget. Tickets to the show are only $55 per person and that includes your dinner with fountain drinks and the show. Alcohol beverages are available for purchase at the location. The buffet menu includes: Grilled Chicken Kalua Pork, Blackened Tilapia, Rice Pilaf, Fresh Fruit, Tossed Salad, Dinner Roll, Mixed Veggies, and Pineapple Upside Down Cake for dessert. If you still don’t believe how truly amazing and unforgettable this luau is, see for yourself what other visitors have to say! “Fantastic time! Beautiful show, humor, and great food. Audience involvement was the best.” – Shelly S.
“… the food was good and the show was great, loved the audience interaction, the dances, the fire show, and the commentary was both funny and interesting for each dance that was presented…” – Perry K.
It’s not every day that you get to take a vacation with your family or friends down to South Carolina’s coast. But it is really a once in a lifetime opportunity to experience the Polynesian culture up close and personal, and for only a small price!